Heavy chrome plated rear bumper to be used in conjunction with overrriders,adds safety and appeal to your investment! Dimensions as follows: Overall length 45" Height 5 inches Mounting Holes Left To Right & Center To Center Of Holes Is 30 7/8" The Mounting Holes Top To Bottom, Center To Center Of Holes is 2 1/4"
Mounting kit for use with quick jacks or overiders /bumpers . Includes correctly threaded tubing needed for front and rear bumpers and includes bolts ,studs and grommets. Unpainted steel ,Also available fully chromed see VW 885C. Bumper Mounting kit for use with quick jacks or overriders /bumpers same as VW885 except heavy chrome plated. Heavy chrome plated front oval bumper and is designed to be used with overriders Mounting dimensions are as follows: The distance between the mounting faces where the overrider bolt on is at aslight angle and measures as follows: The Bottom Is 28 5/8". The Top Is 28". The Mounting Holes From Top To Bottom And Center To Center Of Holes Is 4 15/16". original style door latches patented in the late 19th century for carriages these have a smooth double step latching mechanism that is still popular today. These sturdy hinges are formed cold rolled steel tubing with adjustable mounting plates.Use on doors,a simple solution and much easier than trying to fabricate yourself! 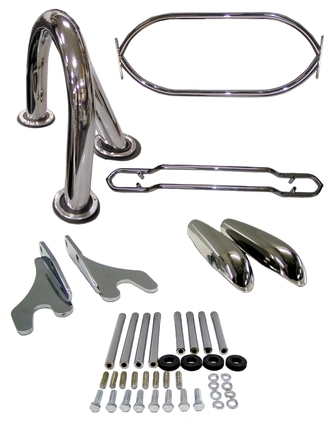 Stylish original pattern hood handles ,heavy chrome plated complete with latches and gaskets to protect your paintwork. A much more authentic option that hood pins ! 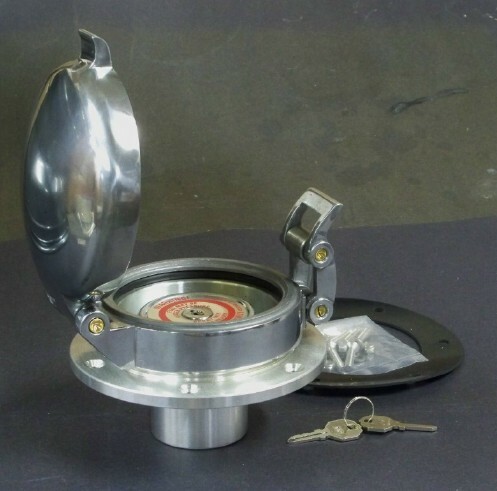 Includes rod ,rod pivot bearing ,aluminum rod receptacle for hood and hold down clip.